This software is available for personal computer. Data collection software package designed especially for Tohnichi product line. 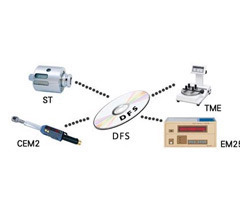 DFS is the software used for the data processing, measured by ST, CEM, TME, etc. Data, measured by digital instrument, can be input by manual or automatic. Data can be deleted or changed as required. Statistical process maximum value, minimum value, range, average value, standard deviation and Cp value are picked up among the data in display and the histogram is displayed. File As 100 data as one file, up to maximum 50 files can be saved.